To my throngs of ardent Porthole Cruise followers (both of you! ), you know I love to expound on regional foods. Well, it’s been two days since I posted anything about that dear to my stomach subject, so allow me fill the void in your never ending search for culinary enlightenment. In Abruzzo, Italy on an appetizing pre-cruise holiday, somewhat sandwiched (panini’d) in between Tuscany, Venice, the spectacular Gran Sasso mountains and the Adriatic coastline are a sight to behold. I’ve previously pointed out that although Abruzzo borders the beautiful, deserted beaches of the Adriatic Sea, it doesn’t have a single cruise port but should be considered as a pre or post cruise destination. I have a thousand words to describe the region, it’s people and absolutely stunning landscape, but this article is about its typical and endemic food. Venice can relish its claim on seafood, Naples, it’s pizza and Rome, it’s pasta. Here it’s all about arrosticini and porchetta, with a slight nod towards regional pasta and the area’s lesser known, but superb wines. We’re not talking about their ultimate destiny as lamb chops, leg of lamb or stew. Here arrosticini reigns supreme. Food And Wine Magazine described it as “the best Italian food that no one knows about”. 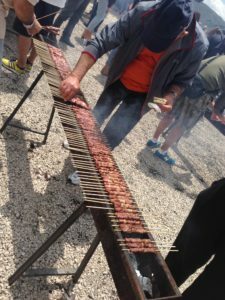 Small cubes of lamb on a skewer, barbecued over hot coals takes the regional dish award. To start with you need the right kind of grill, one that you will only find here but available in every home improvement store. Picture a 2-3 foot rain gutter with closed ends and you have it. Filled with charcoal, embers encouraged with blown air from hairdryers (amateur), leaf blowers (expert) or flame throwers (professional). Skewers rotated by hand to grill all sides of the diminutive cubes, salted and then bit directly off the stick. 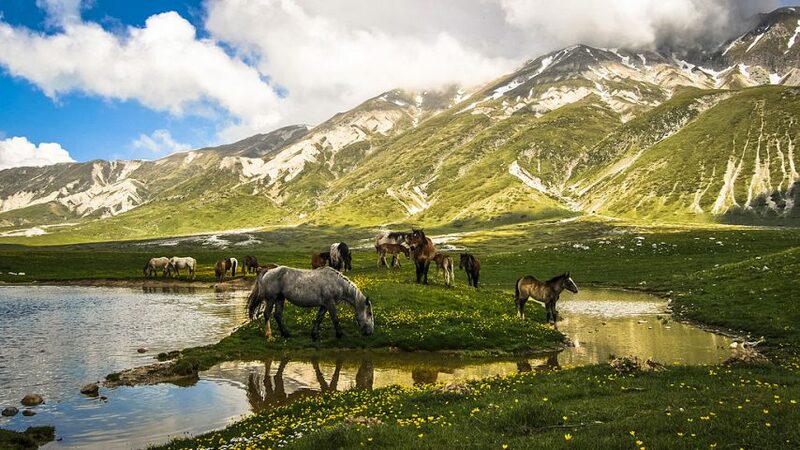 If you are fortunate enough to visit the area, plan a trip up into the mountain area of Campo Imperatore. 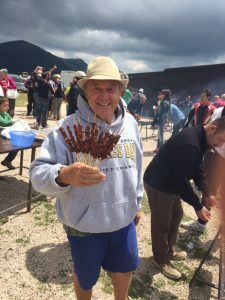 Here in the middle of an alpine plain, there is a butcher shop that will sell you the prepared skewers and provide dozens of hot coal grills and tables where you can picnic with the locals. 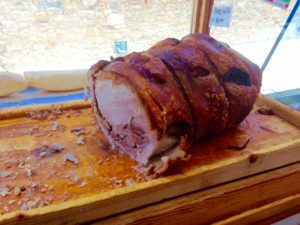 Porchetta. Typically sold out of immaculate food trucks, market days provide the best opportunity to sample the best roast pork I’ve ever tasted. Available as a per kilo takeout option or as panini, supermarket delis also cash in on its popularity. Imagine a round 3 foot log of tender boneless pork, slow roasted and wrapped in a crust of crackling skin. Although similar to the Cuban lechon version, it works it’s magic with unique seasonings. No need to expound on this as it goes without saying that no Italian meal is a meal without it. One type called Mugnaia is from Elice and is typical of the area. A long, fat and flat noodle and prepared with a variety of sauces. Montepulciano d’ Abruzzo is the standard bearer of the region although others such as Pecorino and Trebbiano also hold court in the vineyards of the area. The vine covered hills of the San Lorenzo Winery dominate the area around Elice, Casabianca and Castilenti and provide a palette of colors that is simply amazing in the fall. Although the wines may not reach the superlatives of the more expensive Tuscan varieties but hold their own given that the price is unbelievable. Imagine a good quality wine for only $2.50 a bottle. When planning your next Italian cruise try to save a few days of your precious holiday time and consider the Abruzzo region as an extension. You won’t find many tourists and you certainly won’t go hungry!